On June 7th, 2008, I was invited to a "house warming." Two long time friends of mine was having a housewarming. The word was: "Be On Time." I wasn't told that because generally, I'm on time. But, this was the one time I was running late. I was in a panic. I was picking up my "late person," who really was a little late considering HE had all the extra time in the world. But, I digress ... I was SO happy for Georgette and Charlene. They've been together almost ten years. I love them dearly. When I think of them, my love blossoms. It really does. I forget that sometimes because I don't see them on a regular. They're really good people, so I had to be there for their housewarming. It was a comedy of errors, but I made it there. We were gathered in the backyard. It was hot as HELL. I'm not joking. It was hot. Really hot. It was so hot ---- "How hot was it?" It was so hot, Victor didn't even have a drink. I'd also heard a rumor that it was going to be CATERED and that Georgette wasn't allowed to cook. Georgette?!? Our beloved --- our very own Georgette wasn't even allowed to cook? She was actually supposed to ENJOY the day without puttering about and making sure that everybody else was okay and having fun? As one of our persona would have said, "I smell a rat." But ... I didn't. When I don't expect trickery from certain people, those senses turn off. But ... had I put on my Nancy Drew penny loafers and grabbed a flashlight and magnifying glass, I would have put the clues together. I heard a rumor about a band and a dance troupe. (The dance troupe never showed. Were they even supposed to be there?) The programs were passed out. Programs? Where was I? The Kennedy Center?!? I was so unfocused that I didn't even notice the mention of exchanging of vows!!! 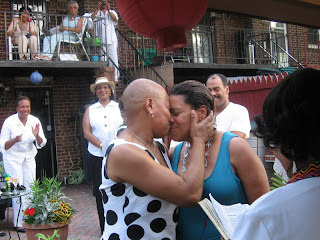 Our beloved Georgette and Charlene were getting married. I'm just getting to this now because I wanted to get permission first. 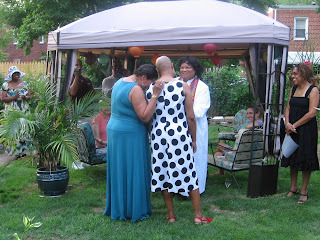 But, my Georgette and Charlene tied the knot. And, I couldn't be happier for them. They mean the world to me and the rest of the world (or at least the two other people who read my blog) should know that marriage is still a wholesome and wonderful thing ... and that two of my favorite people in this world are married. This is my ode to them because I gave them a housewarming gift and not a wedding gift. My fellow tough talking (and hilariously foul mouthed) Aries, Charlene is just a big baby as me. 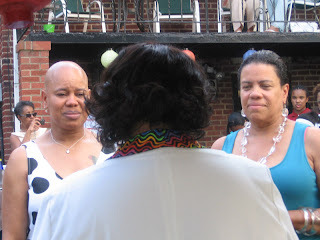 Charlene ... the tears, after those beautifully exchanged vows brought me to tears as well. But, I'm a complete sap and easy. My newest dynamic duo: Georgette and Charlene. Words can not express my complete happiness. Really, girls. I mean it.